Hurricane Karl grew with surprising speed into a powerful Category 3 storm Friday, prompting closure of Gulf of Mexico oil facilities, and forecasters said the storm could strengthen further before hitting near the country's largest power plant. Karl's maximum sustained winds already were near 120 mph (195 kph) Friday morning, according to the U.S. National Hurricane Center in Miami. State-owned Petroleos Mexicanos closed 14 production wells in the northern part of Veracruz state and evacuated workers from some oil platforms, the company said in a statement late Thursday. The storm's track would carry it close to the Mexico's largest power plant -- and only nuclear generator -- at Laguna Verde. It would then roar into the mountainous, flood-prone region where a storm killed more than 300 people in 1999, most in landslides. The Mexican government issued a hurricane warning for a 186-mile (300-kilometer) stretch of coast in Veracruz state, stretching northward from the city of the same name. On its predicted path, Karl could make landfall between the port of Veracruz and the oil hub of Poza Rica. Poza Rica, while slightly inland, houses important pipelines and natural gas- and oil-processing plants. Authorities in Veracruz state -- whose southern half has suffered severe flooding over the past few weeks -- braced for a hit, preparing sleeping mats, bottled water and other supplies for anyone taking refuge in shelters. Workers in Veracruz city cut dangerous tree limbs that could become flying debris. About 80,000 people have had their homes damaged and nine people have been killed in flooding from heavy rains in southern Veracruz since Aug. 19. Officials expressed concern Karl could raise river levels again, just as some residents are thinking of returning to their homes. In the beach town of Tecolutla, just south of Poza Rica, fishermen and operators of small tour boats began pulling their craft out of the water. Some people boarded up windows with sheets of plywood, lashed down cooking gas tanks and reinforced doors and signs to prevent them from being blow away by the hurricane's wind, said Tecolutla's civil defense director, Edilberto Peralta. "We are getting ready and warning people early, to avoid any loss of human life," said Peralta, whose town of about 25,000 people was lashed by Hurricane Dean in 2007 and severely flooded by a tropical depression in 1999. "We are ready to take drastic measures." He said officials were considering whether any residents needed to evacuate their homes. The port of Tuxpan was closed to small craft Thursday, and Port Capt. Gaspar Cime said larger vessels would be banned later in the day. Tuxpan has about 135,000 people. By Friday, Karl was centered about 50 miles (80 kilometers) northeast of Veracruz. It slowed slightly on its westward path, moving at 9 mph (15 kph). Meanwhile, Hurricane Igor's top winds weakened Friday to 120 mph (195 kph) on a track that could take it over Bermuda by Monday. The government of Bermuda issued a hurricane watch. 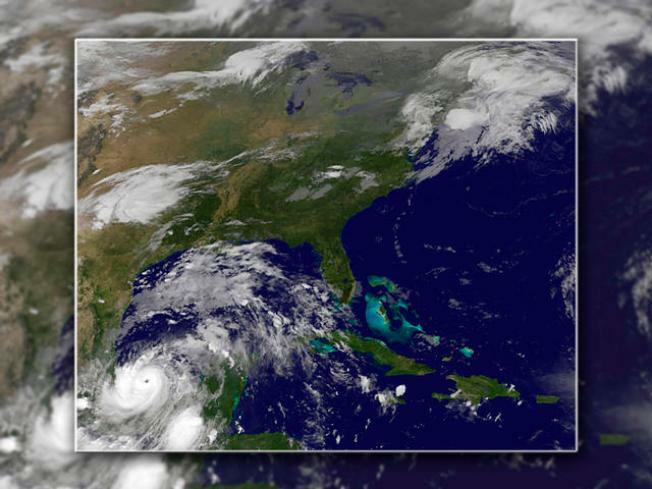 Farther east over the Atlantic, Hurricane Julia strengthened slightly early Friday, though remained a Category 1 storm with maximum sustained winds of 85 mph (140 kph). Karl could cause storm surges of 6 to 9 feet (2 to 3 meters) and "large and destructive waves," as well as dump up to 15 inches (40 centimeters) of rain in some areas of Veracruz state, the U.S. National Hurricane Center said in a statement. As a tropical storm, Karl hit Yucatan on Wednesday, downing tree limbs and causing power outages. The storm made landfall on the Mexican Caribbean coast about midway between the cruise ship port of Majahual and the coastal town of Xcalak. Associated Press Writer Mark Stevenson in Mexico City contributed to this report.